Christmas with Sonic Ho ho ho? Just as lovely as previous years, still couldn't stop laughing at how Silver casually flung a bear across the forest. 6 years now, crazy man that this has been a tradition for soo long but hopefully it continues for many more. Anyways, loved it but it felt short this year its just me though because its the near same length as all the others. A little past the season now, but just wanted to pop in and say how much I love these! My brothers and I have watched them every year around Christmas for several years now and they're always fantastic. Hoping you continue this awesome tradition! Hey everyone. I've got some news that will put coal in your stockings. We have decided that we will not be doing a Christmas with Sonic this year. I know it's absolutely heartbreaking and we share the pain too. There's a lot to why we aren't doing one but know it was not an easy decision. We made 6 of them in a row and we hate to break our tradition but I assure you it's for the best for Riana and I. The primary reasons are that we went through about 5 different stories and none were good enough to us. After just coming off of Sonic in Scared Stupid Part 3 which was a massive undertaking, we also basically didn't have as much time as we wanted. Riana is also super busy with her own work. She has 4 jobs at the same time right now and taking time out of her schedule for Christmas with Sonic would only be worth it if we had a story worth telling. We also just aren't feeling it this year. We fully understand if this upsets anyone but you still have all 6 to re-watch this holiday! I'll be making a video soon about it with some other details but we hope you guys still have a great holiday. That's a shame, I loved these videos. The animation style in particular, I have nothing against the regular 3d animated ones, but the hand drawn style had so much more personality in my opinion. Oh well. I hope we'll get one next year, this year just wasn't a good one for this apparently. A shame, but I look forward to next year's if it happens. May take this opportunity to watch all of the old ones again, it's been a few years since I've seen a couple of them! This topic was bumped so I thought maybe I should make a post! Yeah we're not doing one this year. Basically we ran out of time and couldn't come up with a story worth telling. Riana is also super busy with work right now and I just came off of a huge project (A Halloween themed Sonic video) https://www.youtube....?v=SawYRdsOzz0. We did an illustration to hopefully make up for it! Thanks for taking the time to do this, it's a marvelous drawing. The lighting is spectacular. I got to say, ever since I saw the series, I just can't get the idea out of my head of shadow being able to be a master Chef. Would be awesome if this came back this year. I can understand that it was a lot of work, at an especially busy time of year... I know a lot of us really looked forward to it, and I hope the creators know that. No worries, because he teased it at the end of his latest animation. 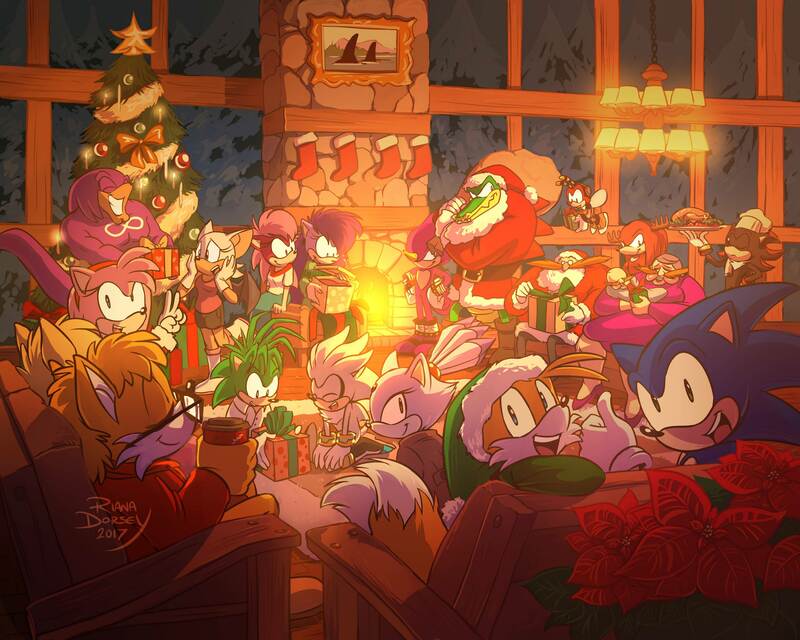 I don't have a whole lot of holiday traditions since getting married and moving away from my hometown, but My wife and I always watch the Christmas with Sonic series in the days leading up to Christmas. We are most definitely doing one this year! Awesome! good to know man, can't wait for it.